The Wick Poetry Center at Kent State University has announced their slate of events, readings, exhibits, and a creativity festival, starting this Thursday (!) with a poetry reading at the Akron Art Museum. We are excited to share this years' reading series with you below. Join us for a full slate of readings and events starting this week at the Akron Art Museum. From the Stan and Tom Wick Poetry Prize Reading honoring Michael McKee Green's new book with contest judge Khaled Mattawa to Celebrating Our Own and our 17th Annual Giving Voice, we hope you'll join us this year. To open, we are inviting you to attend the first event of the Series: Poetry Reading at the Akron Art Museum this Thursday, September 13, at 6 pm. Poetry Reading with Wick Poetry Center and Urban Vision below the Nasser Al-Salem Arabi/Gharbi neon installation in the lobby of the Akron Art Museum. Stay and tour the exhibition FRONT: An American City after the reading. The Kent community invites you to join us for the annual Kent Creativity Festival! This will be an opportunity for people of all ages and skill levels to come together to create, share, and explore the creation of all kinds of art. A recipient of awards and grants from the Academy of American Poets and the Cabin Literary Center, Michael McKee Green is a 2018 artist in residence at the Boise Public Library at Bown Crossing. Poems of his appear in journals such as Michigan Quarterly Review, Tagvverk and Fog Machine, and his poem "In Remit" won the Burnam Poetry Scholarship (Judge, Ed Skoog). Currently, he is an MFA candidate at Boise State University, where he sits on Ahsahta Press’ editorial board and teaches creative writing. Khaled Mattawa was born in Benghazi, Libya, in 1964 and immigrated to the United States in his teens. His collections of poetry include Tocqueville (New Issues, 2010), Amorisco (Ausable, 2008), Zodiac of Echoes (Ausable, 2003), and Ismailia Eclipse (Sheep Meadow Press, 1995). He is also the author of Mahmoud Darwish: The Poet’s Art and His Nation (Syracuse University Press, 2014). Mattawa has also translated many volumes of contemporary Arabic poetry and coedited two anthologies of Arab American literature. Mattawa is the 2010 recipient of the Academy of American Poets Fellowship. 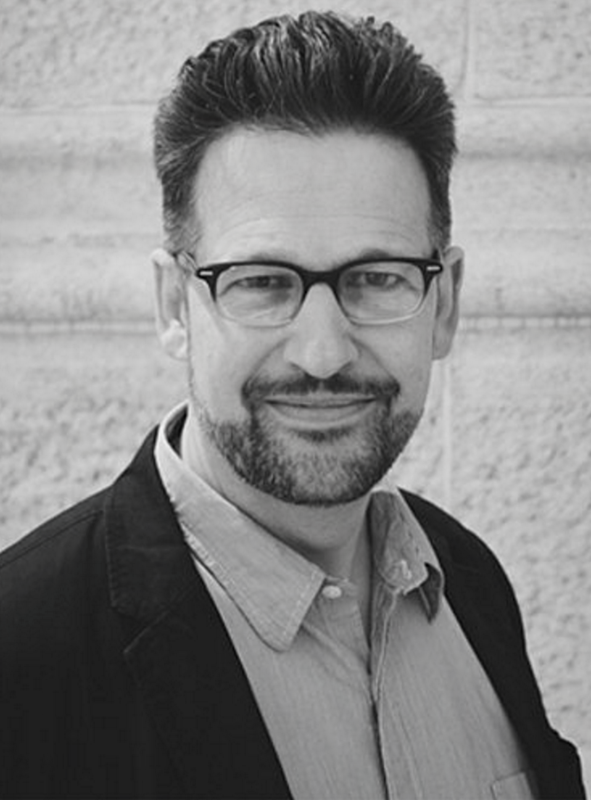 He has received a Guggenheim fellowship, a translation grant from the National Endowment for the Arts, the Alfred Hodder Fellowship from Princeton University, the PEN American Center Poetry Translation Prize, three Pushcart Prizes, and a MacArthur Fellowship. In 2014, Mattawa was elected a Chancellor of the Academy of American Poets. Currently, Mattawa teaches in the graduate creative writing program at the University of Michigan, Ann Arbor. A collaboration of words and art between the artists of the Group Ten Gallery and the Wick Poetry Center. Come to celebrate poetry with us by sharing your poems and discovering the new voices around you. Kent State international students, staff and faculty members from different countries will share poems they love from their own cultures facilitating a global conversation through the intimate and inclusive voice of poetry. George Bilgere's seventh collection of poetry, Blood Pages, was published by the University of Pittsburgh Press in 2018. He has given readings for the Library of Congress, the 92nd Street Y in New York, A Prairie Home Companion, and at schools and literary venues all over the country. 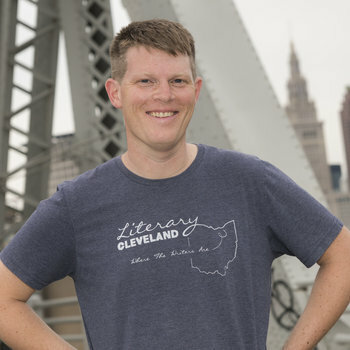 He has received a Pushcart Prize, grants from the National Endowment for the Arts and the Ohio Arts Council, the Midland Authors Prize, the May Swenson Poetry Prize, and the Fulbright Foundation. Former U.S. Poet Laureate Billy Collins has called Bilgere's work "a welcome breath of fresh air in the house of American poetry." He teaches at John Carroll University in Cleveland. Kate Daniels was born in Richmond, Virginia. The first in her family to graduate from college, Daniels earned a BA and an MA from the University of Virginia and an MFA from Columbia University. She converted to Catholicism as an adult, and her often lengthy, narrative poems engage engages themes of working-class experience, family, trauma, racism, and Southern culture. Daniels has won the Hanes Award for Poetry from the Fellowship of Southern Writers, a Pushcart Prize, the Louisiana Literature Prize for Poetry, the James Dickey Prize, the Crazyhorse Prize for Poetry, and fellowships from the Lannan Foundation and Harvard University's Bunting Institute. Her work has been widely anthologized, including in Best American Poetry. She has taught at Bennington College, Louisiana State University, the University of Virginia, and Wake Forest University. Currently, she is a professor of English and Creative Writing at Vanderbilt University. We hope to see you at the readings! 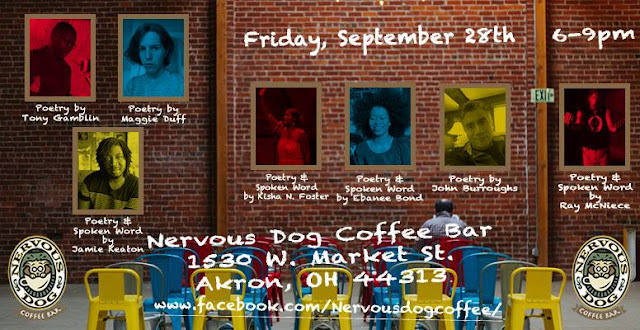 Michael DeBenedictis has been hosting a poetry series the last Friday of every month at Nervous Dog Coffee Bar, 1530 W. Market Street in Akron, Ohio. The show often features music in addition to spoken word. This month's installment (September 28th from 6 to 9 p.m.) features several Cleveland poets including Ray McNiece, Kisha Nicole Foster and John Burroughs.